New functionality is the ability to check loaded datasets for duplications. To activate the feature, check the box "Check loaded datasets on add" (#3), as shown above. Also new is the Search function (#A), discussed below. The Check feature will check all loaded Toggle datasets, including the designated Specialty dataset. What that means is that if you have a dataset called Novelists but that dataset is not being used in your current project and thus is not "loaded" or active in a tab in Toggle Word Manager or Toggle Specialty Manager, the Novelist dataset will not be checked. 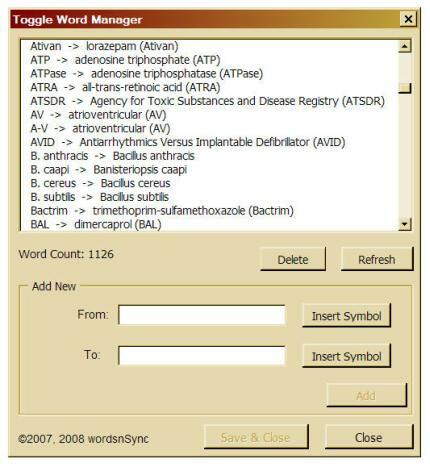 An example: As the image below shows, the acronym "Ad" and its definition "adenovirus" (#4) are to be added to the Toggle Words tab of the Toggle Word Manager. In addition to the Toggle Word Manager, the Toggle Specialty Manager is active (#8) and has a loaded dataset (#5) that already includes the acronym and definition (#5). The loaded datasets will be checked because the Check box is checked (#7). The dialog shows what entries were found (#10) and in which dataset they were found (#11). By default, the delete options are checked (#12). What that means is that the checked entries, which in this example are found in the Specialty dataset, will be deleted from the Specialty dataset when the Delete button (#13) is clicked and added to the Toggle Words dataset. 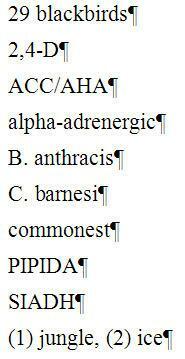 If you want to retain some or all in the Specialty dataset, uncheck the appropriate Delete checkboxes (#12). If you click Cancel, nothing will be added to any dataset and nothing will be deleted from any dataset. The capability to search the Toggle datasets is also new. Sometimes you just want to know where something can be found and that becomes difficult as your datasets grow (in the image below, the Toggle Words dataset, for example, has more than 2500 entries [#B]). Thus the search function (#14) shown below. Enter the initialism, acronym, or phrase to search for in the search field (#15), click Search (#16), and if the phrase is in one of the loaded datasets, the name of the dataset will be shown (#17). Although the words added to the new tabs of the Word Manager could also be added to the original Toggle Words tab, the addition of these tabs allows for better organization and prevents the initial list from becoming wholly unwieldy. This is the most important change to these managers is the addition of the Acronym/Phrase entry form, which appears in both Managers. This new entry form supplements the original entry form. The original From/To form, shown below, works as at always has. It is intended for single-entry items, such as changing that to who. In contrast, the new Acronym/Phrase entry form, shown below, is intended for those entries where you may need or want to have multiple options for the same word or phrase. Generally, if the acronym is spelled out in the text at first appearance (i.e., if it appears as Los Angeles Police Department and not as LAPD), there is no reason to change it to the acronym form. But if we thought there might be a reason, just as we entered LAPD as the acronym to change in field #1 and Los Angeles Police Department in field #2 in the above image, we could reverse the entries so that we would have it both ways, as shown here (#6). When we enter the acronym (#1) and phrase (#2) in the fields, we need to make a choice in the Entry Options (#3) as to what forms are to be added to the dataset. The default is All, which produces the entries shown at #5 or #6. Clicking Add (#4) adds the choices to the dataset. Rather than entering each of these options one-by-one using the From/To tab entry form, the Acronym/Phrase entry form lets you create all entries simultaneously — a much quicker and more accurate entry method. New in Toggle Word is Word Specialty Manager and the ability to have specialized Toggle datasets in addition to a more general Toggle dataset. The Word Specialty Manager is accessed from the Toggle Word menu. and then (2) select the specialty word file to be used from those displayed in the Open dialog box. The Specialty Word dataset acts as a supplement to the primary Toggle dataset. When you run the Toggle macro, it will search both datasets. The idea of the specialty dataset is that you may work on projects or for clients with their own unique word requirements. Using the specialty dataset lets you have a Toggle dataset that is just for the particular project or client, as well as a general dataset that is more universal in its application. Imagine how useful Toggle Word can be for you! The Toggle macro is similar to the Journals macro in that it has two components: the macro itself and a Manager. The Manager is where words and phrases are entered, creating the dataset from which the Toggle Word macro draws. The Manager, shown here, enables you to insert words, phrases, and symbols in the From and To fields. The easiest and best way to use the Toggle Word macro and Manager is to assign each to its own key or key combination, such as F11 and F12. Doing so makes using Toggle Word quick and efficient. In the case of phrases (e.g., 2,4-D, ACC/AHA, B. anthracis, (1) in the example), select the phrase and run Toggle Word; in the case of an individual word (e.g., SIADH, commonest, 29 in the example), simply place your cursor in the word and run Toggle Word. The advantage of Toggle Word is that its dataset is virtually unlimited, which means that it can contain thousands of entries, all of which are available each time you use EditTools to edit a document. Imagine how much quicker and easier it would be, for example, to change numbers to letters, to spell out acronyms, to change an author&apos;s style to the house style, to change one symbol (e.g., an n-dash or an x) to another (e.g., a minus sign or multiplication sign). Think of the time that would be saved and the typing errors that would be avoided.